Baker, a graduate of The Walker School, has scored in double digits in three of the last four games. 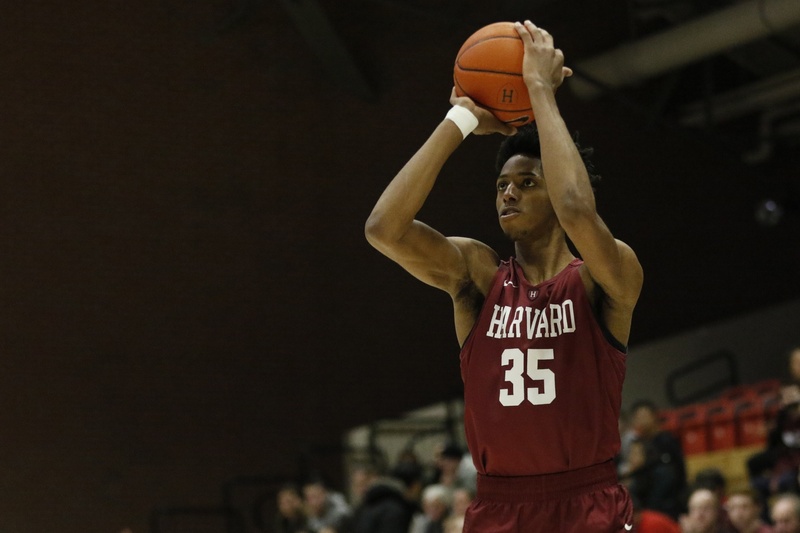 On Friday night, a dozen or so NBA scouts descended upon Lavietes Pavilion as Harvard men’s basketball hosted Yale in front of a sell-out crowd. 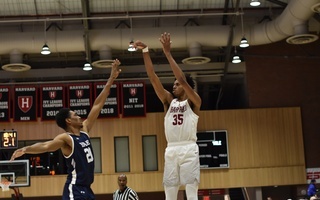 The prized target was not dressed in a crimson uniform but rather Yale’s junior standout Miye Oni, who had been turning heads with his versatile scoring and lengthy frame. But while the Bulldogs’ wing had a largely quiet night, it was someone in the home white unis that was quickly making an impression. Like Oni, this Crimson player stood out for his enormous wingspan, ability to defend multiple positions, and rebounding aggressiveness. By the 16-minute mark of the second half, he had drained his career-high fourth triple of the contest — which in fact surpassed Oni’s scoring total for the entirety of the game. That final trey? An electrifying corner shot in front of the Crimson bench, in which he made sure to acknowledge with a loud roar and head-bob before rushing back the other end. This would complete his third of four games with 20-plus minutes of playing time, three of which he finished in double-digits. Listed as 6-foot-11, 205 pounds, the Woodstock, Ga., native and all-time leading scorer at The Walker School immediately stands out to onlookers with his slender, physical frame. For those who follow the NBA, including Baker himself, there are immediate resemblances when juxtaposing playing styles. 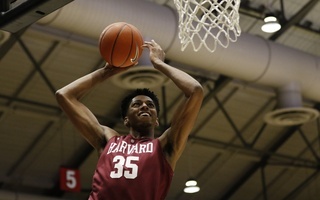 In fact, the junior’s original selection of his jersey number, 35, can be attributed to the athlete colloquially known as “KD.” On Jan. 28, the two-time NBA Champion and 2014 MVP stepped inside Lavietes Pavilion for a post-Celtics game practice, and posed for pictures with Harvard’s 35 afterwards. Baker admitted he had other initial inclinations in choosing his Crimson jersey number, but nevertheless embraces Durant as a role model. Unlike the 2008 NBA Rookie of the Year, though, Baker’s emergence into college basketball was anything but smooth sailing. Ranked as the 97th player coming out of high school in ESPN’s 2016 Top 100, the Winthrop resident did not earn comparable playing time to the other highly-touted freshmen in his class — one that included immediate starters Chris Lewis, Seth Towns, and Bryce Aiken. In his first season, Baker averaged just 2.8 points in 8.4 minutes per game, posting a career-high eight points late into the season against Penn. 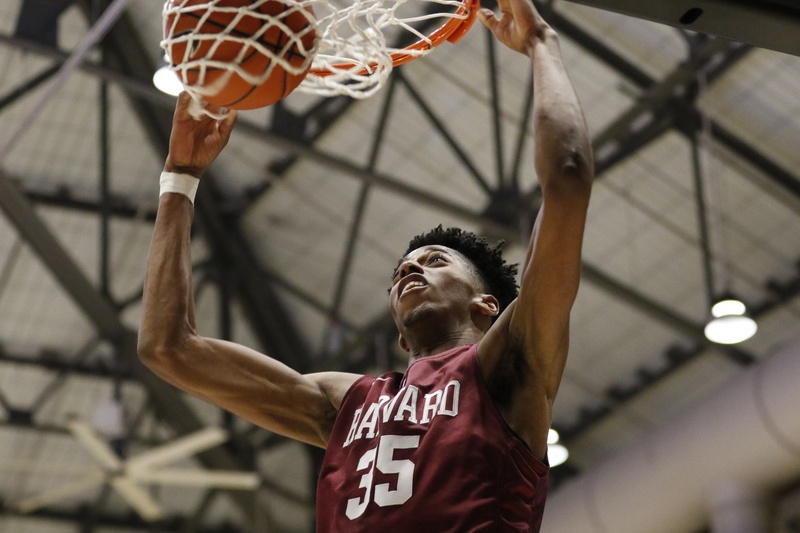 Sophomore year ended in similar results, as it appeared as if Baker was becoming coach Tommy Amaker’s high-energy insert for a few minutes off of the bench. And finally, it appears as if the opportunity has arrived for “Bobby Buckets.” As someone who “wears his emotions on his sleeve”, according to classmate Justin Bassey, and always seemed to have a joy and ease to his demeanor, it was never the attitude that limited Baker’s playing time. Instead, the Atlanta native has earned a spot in the starting lineup recently due to his energy off the glass and defensive prowess, affirmed by teammates and coaching staff. 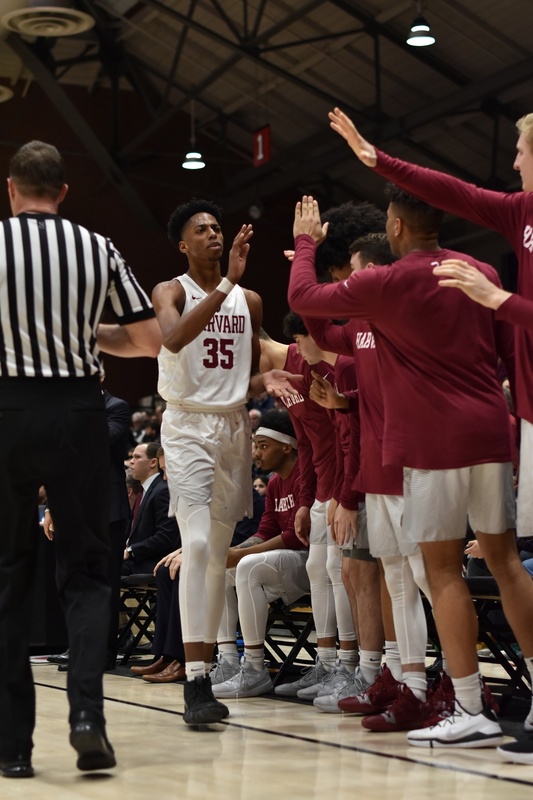 One of the more upbeat members of the team, Baker provides great energy to Harvard on and off the bench. From a statistical standpoint, Baker is one of the Crimson’s most efficient players — particularly in metrics outside of scoring. The junior trails only Bassey on the team in defensive rebounds per game at 3.5, and has accumulated 12 blocks this season, or 2.0 per 40 minutes. When accounting for his combined body of work, Baker is the second-most efficient Harvard player with a PER of 20.1. Numbers-wise, perhaps the badge of honor is Baker’s team-high total rebounding percentage of 17.8%, one that represents in cold numbers the more intangible awareness and toughness on the boards. In short, expect the 6-foot-11 stretch big to be on the receiving end of the most rebounds while on the court. Furthermore, his willingness to shoot from deep and recent success rate has improved significantly from earlier in the season. Having attempted just seven threes in the first 11 games of the season and converting one, Baker has seen the rim open up as of late. Since the UNC contest on Jan 3., the wing has knocked down 11 of 21 three-point attempts, catapulting his season average to just shy of 43 percent. From three-point range, Baker has knocked down 12 threes at a 42.9 percent clip this season. Numbers aside, Baker has much room left to grow in his final season-and-change for the Crimson. From a physical standpoint, he has already bulked up at least 15 pounds from his freshman year biography. It will be his continued improvement offensively that will make it even scarier for his opponents heading into senior year. For his coach, it is all about consistency that will set in stone his place in the opening lineup. As this season has progressed and Baker has made a welcome stride in his development, a few things remains constant for the man with “EZ” in his Twitter handle: a laid-back passion for the game and an ability to provide an instant jolt of energy to the Crimson. A previous version of the article stated that Baker was second in defensive rebounding to Chris Lewis. In fact, Justin Bassey leads the team in that category, at 5.5/game, as of Feb 8. — Staff writer Henry Zhu can be reached at henry.zhu@thecrimson.com. Follow him on Twitter @Zhuhen88. My mother likes to tell me that she has seen God. That years ago, at the intersection of unspeakable loss and grief, what she felt in that moment convinced her to keep going. In listening to Julien Baker that afternoon, I felt something similar.